What Is Standing In The Way Of This State’s Medical Marijuana Bill? New revisions to Senate Bill 3, and conflicts between the House of Representatives and Senate, might kill the bill that was meant to legalize medical marijuana in Pennsylvania. Pennsylvania residents eager to receive lifesaving medical marijuana are going to have to wait even longer. Earlier this month, after days of negotiations and adding pages of revisions and stipulations, the House of Representatives approved Senate Bill 3 allowing for medical marijuana. Already having the support of Govern Tom Wolf, all the bill needed was the Senate’s approval on changes. The vote was expected to be a quick and easy decisions, but the extensive addendums are giving the Senate cause for rethinking. Confusion over changes made to Pennsylvania’s initial Senate Bill 3, allowing for medical marijuana in the form of pills, oils and tinctures, has halted progress in the Senate. Thought to be taken for a vote in last week’s meeting, the subject was noticeably missing from the schedule. Inconsistent phrasing and impractical implementation are just a few of the concerns raised by members of the Senate. The original Senate Bill 3 was 69-page document, outlining the circumstances that must be met in order to receive a medical marijuana card in PA. The bill also explained the necessary procedures that need to be taken in order to obtain a license to cultivate and distribute cannabis in the state. After picking and pulling apart the bill, the Pennsylvania House of Representatives came up with a revised version, resulting in 154-pages of legislative mumbo jumbo. Senators and lawmakers have already pointed out a series of issues with House-approved bill. The language and reference numbers between the original and revised bill don’t match, making changes incredibly difficult to interpret. Not to mention, restrictions outlined in the new version would make it nearly impossible to actually enact the laws in certain parts of the state; no dispensary can operate within 1,000 feet of a school in Philadelphia, according to revisions, making it unfeasible to build one in Center City. More than doubling the page count of the initial bill has caused many Senators, some among the strongest advocates for the original bill, to reconsider their position on the laws. Senator Mike Folmer, Lebanon County Republican, was the primary supporter of Senate Bill 3, urging the House and the Senate to quickly pass these life-changing laws. Since the revised House version of the bill has come back to the Senate for a vote, even Folmer is considering pulling his approval until changes are made and a re-vote is taken by both chambers. Pennsylvania residents have no choice, but to wait patiently for our government to deliberate wording and numbering on pieces of paper; every minor issue with the bill will continue to create roadblocks and delays. Meanwhile, children are left suffering from brain-damaging seizures that could easily be soothed by medical marijuana. 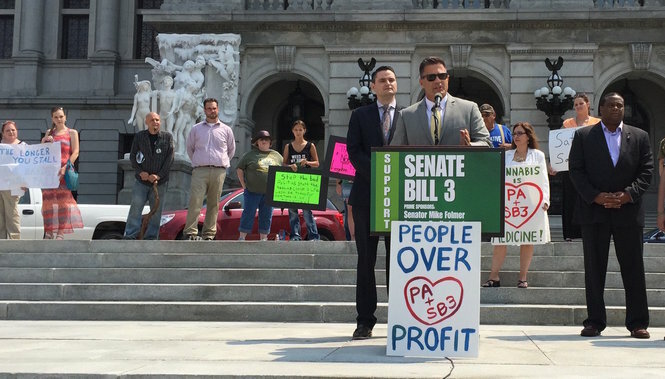 Do you think the PA Senate should approve the revised version of Senate Bill 3? Let us know on social media or in the comments below.